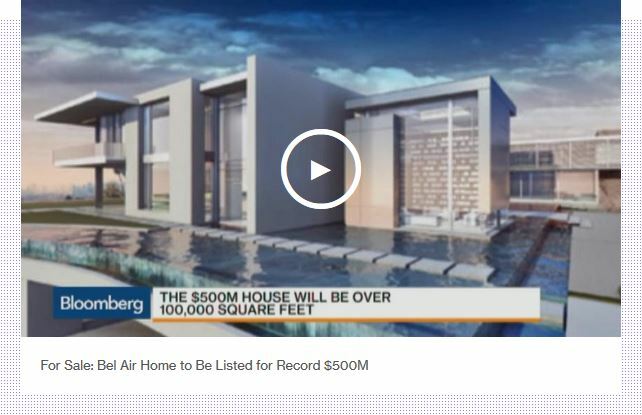 Nile Niami, a film producer and speculative residential developer, is pouring concrete in L.A.’s Bel Air neighborhood for a compound with a 74,000-square-foot (6,900-square-meter) main residence and three smaller homes, according to city records. The project, which will take at least 20 more months to complete, will exceed 100,000 square feet, including a 5,000-square-foot master bedroom, a 30-car garage and a “Monaco-style casino,” Niami said. Estates with views of the Los Angeles basin are the California counterpart to Manhattan’s penthouses or London’s Mayfair manors, drawing a global cast of financiers, technology tycoons and celebrities who collect trophy homes like works of art. Around the world, five properties sold for $100 million or more last year, and at least 20 others have nine-figure asking prices, Christie’s International Real Estate reported last month. The priciest home ever sold was a $221 million London penthouse purchased in 2011, according to Christie’s. The most expensive properties on the market include a $425 million estate in France’s Cote d’Azur, a $400 million penthouse in Monaco and a $365 million London manor. Whether Niami can get more than double the previous record for his mansion remains to be seen. Nile Niami House at 944 Airole Way stands in Bel Air, California, U.S., on Monday, May 18, 2015. Niami’s project, on a 4-acre (1.6-hectare) hilltop lot, will have 360-degree views of the Pacific Ocean, Beverly Hills, downtown Los Angeles and the San Fernando Valley. Plans called for removal of almost 40,000 cubic yards (30,600 cubic meters) of earth, the equivalent of an American football field covered by 20 feet (6 meters) of dirt. The average price of 37 homes sold in the first quarter in the Bel Air-Holmby Hills area of Los Angeles was $5.29 million, down 27 percent from a year earlier, when there were several “super deals,” according to an Agency report. New luxury mansions are proliferating in Los Angeles, often without buyers in place, known as building on spec. Niami, whose production credits include “The Patriot,” a 1998 action movie starring Steven Seagal, last September sold a Los Angeles home to entertainer Sean “Diddy” Combs for $40 million. 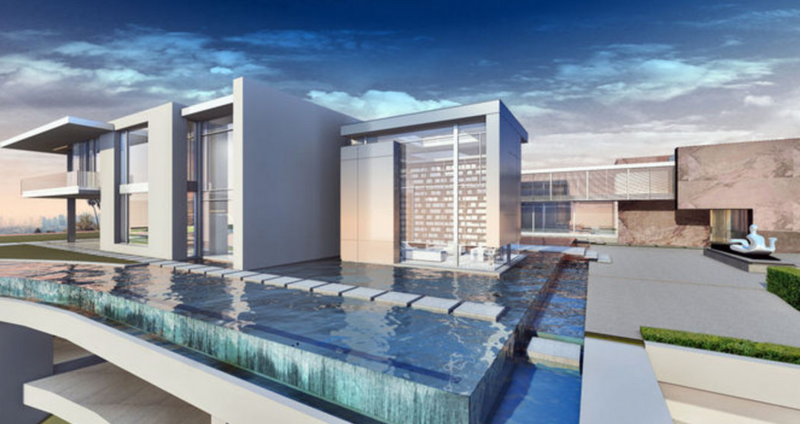 That was followed by the December sale of a Beverly Hills spec home for $70 million to Markus Persson, who last year sold his video-game company to Microsoft Corp. for $2.5 billion. In January, hedge-fund manager Steven Cohen closed on a Beverly Hills spec home for more than $30 million. The mansion includes a 45-seat Imax style theater. The mansion has plans that call for four swimming pools. There are a “lot of things” in the house that will help to preserve water as California suffers from a record drought, Paul McClean, the mansion’s architect, said in a telephone interview. “But those are things that correspond with luxury houses, and I can’t tell you that it’s a green and energy-efficient house,” he said. The “jelly fish room” has tanks on three walls and a light-changing ceiling. McClean, who also designed a 14,000-square-foot spec house down the hill from Niami’s project, is known for creating sleek hillside mansions sold to entertainers and technology executives such as Tyler and Cameron Winklevoss — an enlarged, updated interpretation of the style pioneered by 20th-century Southern California modernist architect Richard Neutra. McClean said he studied commercial buildings such as hotels, museums and art galleries for his latest design. An 8,500-square-foot night club in the under-construction mansion. Notable residents of Bel Air, which is north of Sunset Boulevard and the University of California, Los Angeles, campus, include Tesla Motors Inc. Chief Executive Officer Elon Musk. President Ronald Reagan lived in Bel Air after leaving the White House, which has a floor area of 55,000 square feet. A 258-acre Bel Air plot permitted for 18 homes is listed with an asking price of $125 million, according to Aaron Kirman, a John Aaroe Group agent who has the listing for the development land. “Bel Air is the ultimate trophy,” he said.